This course provides practical, hands-on training to CFOTs who want to learn how to maintain connectors that are used in very harsh environments such as mining, seismic, marine vessels and military. 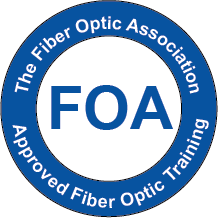 This course focuses on the rugged M83526 second generation (TFOCA-II®) fiber optic connector and its receptacle. Intensive tutoring will give each student ample opportunity to ask questions and receive one-on-one tutoring. The Certified Fiber Optic Specialist in Connectors course covers the many details of working on the rugged M83526 second generation (TFOCA-II®) fiber optic connector and its receptacle. This course focuses exclusively on the rugged M83526 second generation (TFOCA-II®) fiber optic connector and its receptacle. As a result, this is a hands-on course and that means the student will develop the skills needed to terminate, test and troubleshoot this connector. A commercial version of the M83526 connector will be used in all lab exercises. As a result, all the skills, techniques and processes are suitable for usage on all manufacturers of M83526 connectors such as AFSI, Delphi, Glenair, OCC, QPC, and Stran. Time will also be spent examining the rugged cabling these connectors need in order to survive harsh conditions. Contact us if you have any questions about this class.